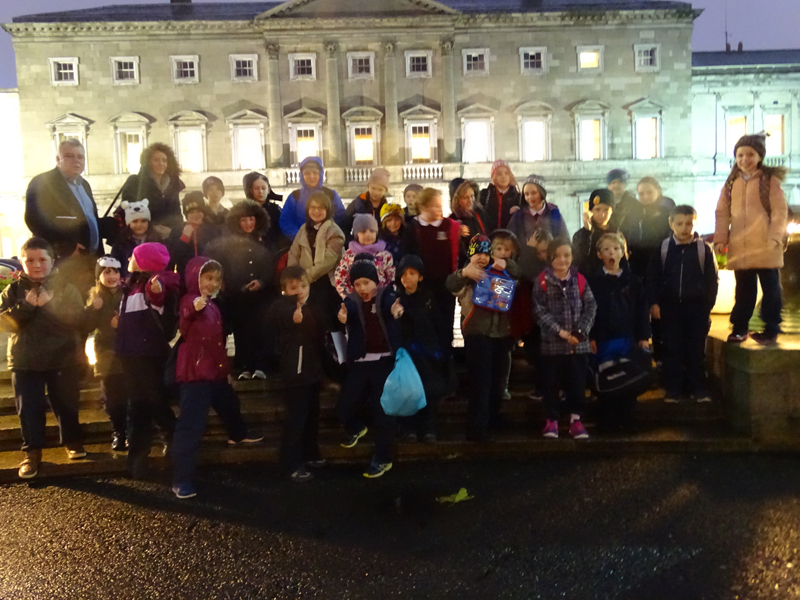 On Tuesday, 15th of December, the pupils in first class to sixth classes went to Dublin. In Dublin, as guests of Deputy Michael Fitzmaurice, we visited Leinster house and Dáíl Eireann. This was a brilliant opportunity for all pupils to see our government offices and take a glimpse of our politicians at work. It was Deputy Fitzmaurice’s birthday, so Nadine presented him with a small cake, made by her Mammy, Maria. Michael gave all pupils pens and souvenirs from Dáíl Eireann. In the Dáil we met various TDs, senators and Ministers, including Shayne Ross, Finian McGrath, Denis Naughton Minister Pascal Donoghue and Terry Leyton. Deputy Naughton also gave a copy of the 1916 Proclamation to all pupils. Before arriving at Leinster House We also took a tour of the Natural History Museum on Merrion Square and afterwards went to the National Gallery. We also visited the Mansion House to see the live crib and walked through Stephen’s Green and stopped in the boating house and visited the Famine Memorial. Read more about our trip on our blog!